Resource coordinator Savanity Davis (right) uses a bullhorn to guide parents and students, with some help from school psychologist Nancy Priegue. Members of the Corona Youth Music Program perform during the fair. Staff from the Alley Pond Environmental Center show a ball python to the children. 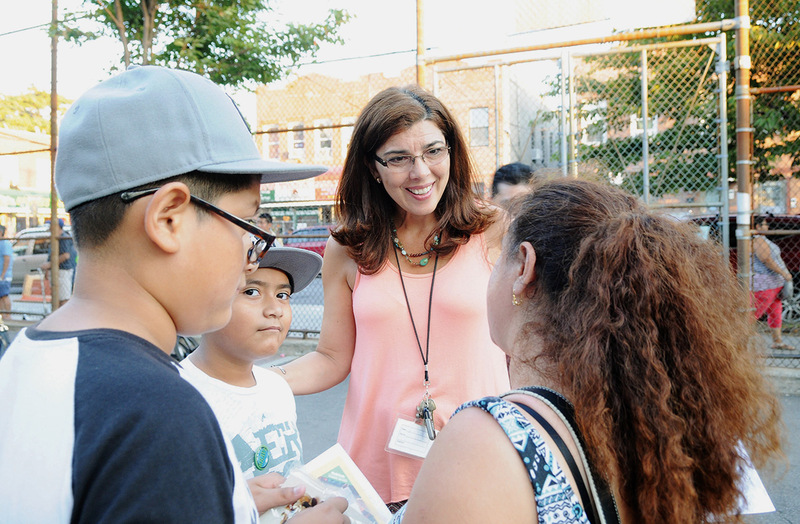 Open School Night on Sept. 17 took place both inside and outside PS 19 in Corona, Queens. Inside, parents met with teachers; outdoors in the yard, there were raffles, dance exhibitions and information booths — the school’s first-ever Community Learning School fair. The event was the brainchild of UFT resource coordinator Savanity Davis. “I was trying to figure out how I could make a footprint at the beginning of the year and prove to the staff that it’s worth being a community learning school,” she said. PS 19, one of the largest elementary schools in the city, is one of 25 schools in the UFT New York City Community Learning Schools Initiative, which provides academic supports and social services to students and their families. Using a white bullhorn, Davis presented student dancers and musicians from a stage in one corner of the yard. Along the fences were booths where the Food Bank for New York City, Queens Legal Services, the city Fire Department, school safety officers, eyeglass and health providers and others answered parents’ questions. The UFT’s new bus was parked along one wall, and President Michael Mulgrew, alongside District 24 Representative John Harrington, was handing 500 free books to children. He was especially proud that parents and staff, including Chapter Leader Richard Burken, had teamed up to win a commitment from the Department of Education to remove six long-standing trailers from the yard. Jonathan FickiesGuidance counselor Laura Jett gives information to a parent. Teachers circulated through the crowd. Michelle Drametenos, the school’s librarian, said the fair means “everyone gets a real taste” of the community schools idea in action.